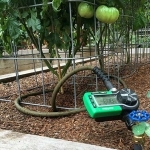 Many gardeners shy away from growing the typical fruit trees and shrubs because of the amount of care and upkeep needed to maintain them, especially when it comes to pest and disease control. Yet some of the more uncommon fruits can be ideal for many gardens because they are so carefree while offering delicious and unusual fruit, along with the attractive ornamental appeal. Our guest today is Dr. Lee Reich. 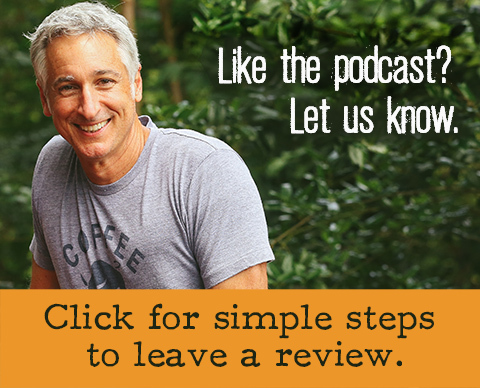 He’s a regular on our podcast with expertise in many areas. 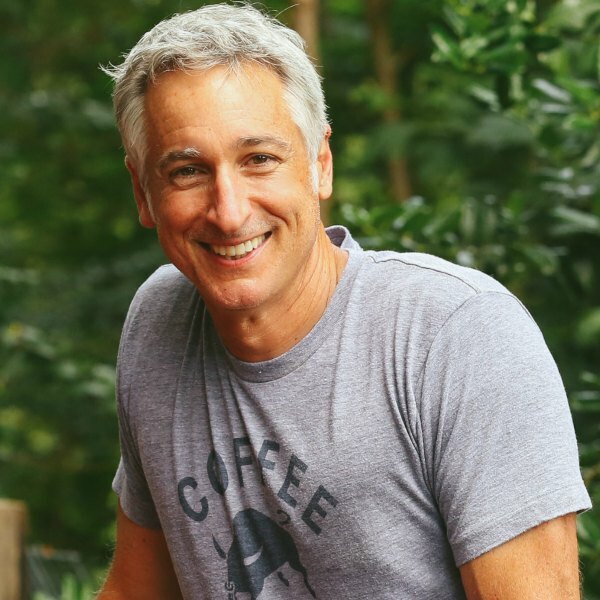 Lee has many gardening passions, yet growing fruit – especially uncommon fruit is at the top of his list. 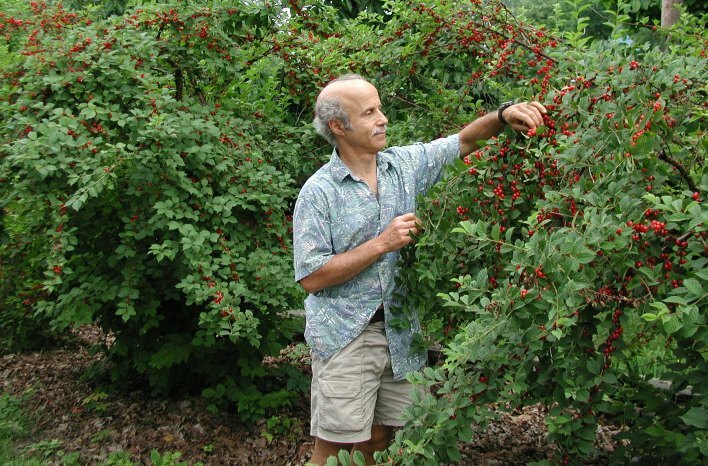 When it comes to Uncommon fruits, Nanking cherry is no stranger to Lee Reich’s garden. In fact, it’s one of his all-time favorites. This is a true cherry. And it’s one of the easiest of all fruits to grow. The only maintenance Lee does is to prune it to keep it from getting too tall. It can easily get to be 10 feet tall and wide. Beyond the aesthetic appeal and delicious fruit, this plant is very cold hardy. But it also grows in hot places because it comes from the hills are Manchuria where temperatures in winter can get to 50 below zero Fahrenheit. And the summer can be 110 F.
If there is a downside to this plant, it’s that the cherries are small – only about a half or five-eighths inch in diameter. On the plus side, the pit is really small, and the flavor is such a true cherry flavor. But there are no named varieties, so there’s a bit of difference from plant to plant. Even so, Lee says they’re all great tasting, somewhere on the spectrum between the sweet cherry and tart cherry. Some are a little more tart than sweet but they’re all good tasting. And they bear so heavily. 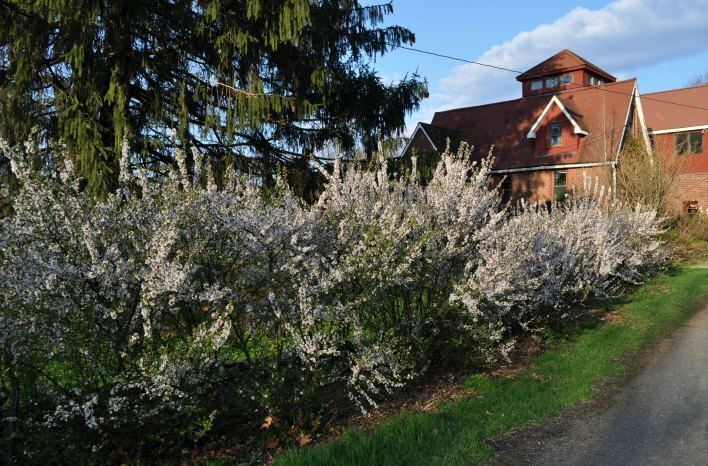 For ornamental value, spring offers the most beautiful show of pinkish white blossoms. But Lee confesses he does not have the patience to harvest Nanking cherries. Instead, Lee walks along the plants along his driveway and strips the fruit by the handfuls and eats them on the spot. However, he does admit that the taste of the juice – undiluted and unsweetened, just straight up is incredibly delicious and so refreshing. 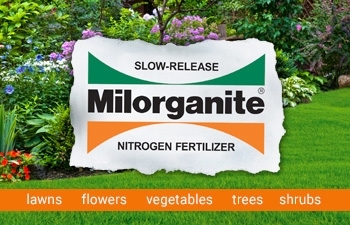 If you plant this, keep in mind that it does require another cross-pollination so plant two. And one more plus – these plants are really cheap, and they grow quickly. Todays’ lineup of uncommon fruit for every garden starts with American persimmon – one of the most carefree fruit trees is also one of the most prolific. 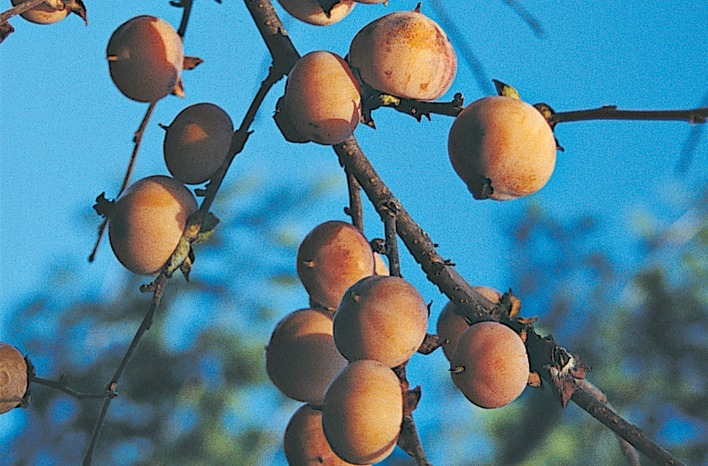 One key reason for its lack of notoriety is because it’s not sold in the supermarket unlike its much better-known cousin, the Asian Persimmon. Both are good tasting fruit and easy to grow. But the American Persimmon is hardier, able to grow happily to zone five and probably to zone four. Ironically the main limitation on zone four isn’t winter kill but just having enough heat in the summer. 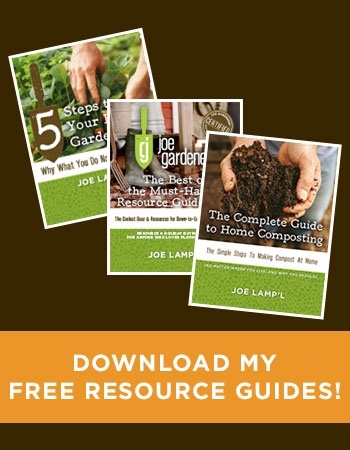 In Lee Reich’s zone 5a garden, he doesn’t have to prune them, nor does he have to do anything for pest and disease control and even better, his American Persimmon is a fruit-producing machine. If you’ve never tried an American Persimmon, you’ll likely want to based on Lee’s description of what it tastes like. According to Lee, a good tasting variety, (and there are several named varieties) is like eating a really good dried apricot soaked in water and dipped in honey with a dash of spice. The first named variety was Early Golden, selected in 1880. And while cultivated varieties taste heavenly, if your only taste experience is with wild persimmons you might have had some unfavorable impressions because eating a bad tasting or unripe persimmon is a very horrible experience. According to Lee, it’s like putting a vacuum cleaner in your mouth and when you take it out at that feeling doesn’t go away. Even Captain John Smith said that when a persimmon is not ripe, it will draw a man’s mouth awry with much torment. But he did go on to say that when a persimmon is ripe, it will taste as good as an apricot. Persimmons are a great backyard tree. If you plant a good variety of American persimmons, you don’t have to do anything for it, except when you plant it. 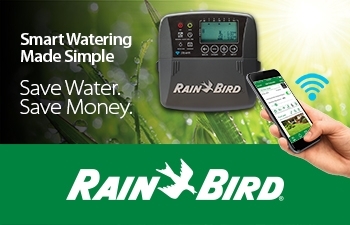 Keep the weeds away while it’s young and keep animals at bay. Fortunately, deer are not fans. Persimmons have an ornamental value in the landscape too. And while persimmon blossoms are not showy at all, the blossoms are very late, so they never get frosted, which is always a problem with apples, peaches, other fruits. Yet persimmons are especially attractive in the fall when the fruit is ripe. Once the leaves are gone, the branches are covered with golf ball sized orange fruit. The fruit starts usually in late summer and persists into fall. 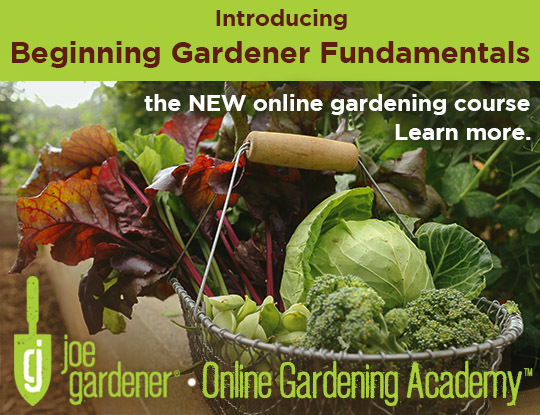 The key is to have a variety that ripens within your growing season. Cultivated persimmons, unlike many other fruits, are self-pollinating. However, in the wild there are male persimmons and females, so you would need a male tree to go along with the fruit-bearing female. But a lot of the cultivated named varieties like the ones Lee grows don’t need a male pollinator, which is very good. The most important consideration for American persimmon growing success is to plant it in a sunny spot and use a named variety. 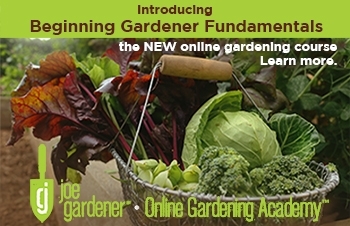 Then you’ll know that the quality is good, and the variety should be one that will ripen within your growing season. So where does one find appropriate varieties? Lee suggests specialty nurtures. 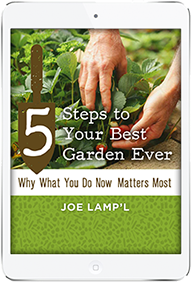 Fortunately, he’s provided many reliable sources in the appendix of his book, Uncommon Fruits for Every Garden with recommended sources for each of the plants and trees. 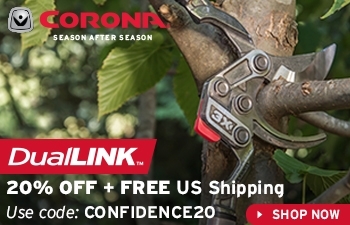 While the tree you order may only be about three to four feet tall, a small tree really establishes quicker. After a few years, research has shown that small trees will outgrow a larger tree. The mature height of the American persimmon is about 50 feet – especially as you go further south. When the fruit is ripe it tends to drop from the tree. Lee’s harvesting method is to just pick them up off the ground. But because American Persimmons are soft fruit, Lee prunes his trees to limit the height so when the fruit does fall, it’s not damaged by the impact with the ground. Lee thinks that one of the most important reasons for a fruit to be uncommon is that like a lot of other things in the markets, they are commodified now. And when things are commodified, two things happen. First of all, appearance sells. People are used to certain appearances and fruits that they buy. Most fruits grown for commercial production have a very durable shelf life. American Persimmons do not meet those criteria. Secondly, mass-market fruit needs to appear to, well, the masses. Lee thinks that about 30% of the population love persimmons. But if 70% don’t, that might not be something any business wants to market. The other reason is physical appearance. Unlike the perfect red apple, American Persimmons have not been bred for durability and shelf life. To be clear, Americans eat with their eyes. .When Lee test markets persimmons and customers taste it, they buy at almost any price. It just tastes that good. Unlike Asian persimmons, there has been little breeding on perfecting mass market traits of the American persimmon. But Lee’s hoping any changes coming don’t affect the flavor too much. To Lee, the way it tastes now is as good as he would ever want it to taste. And you know, when you grow it in your backyard, who cares about shipability. Perhaps the most unusual fruit in Lee’s book is Shipova. It’s an intergeneric hybrid – a hybrid between two genera. Shipova is a hybrid between the European pear and the common whitebeam. Perhaps one of its greatest attributes is that all the trees for sale these days trace their origin to a single tree from a botanical garden in Paris planted in 1837. 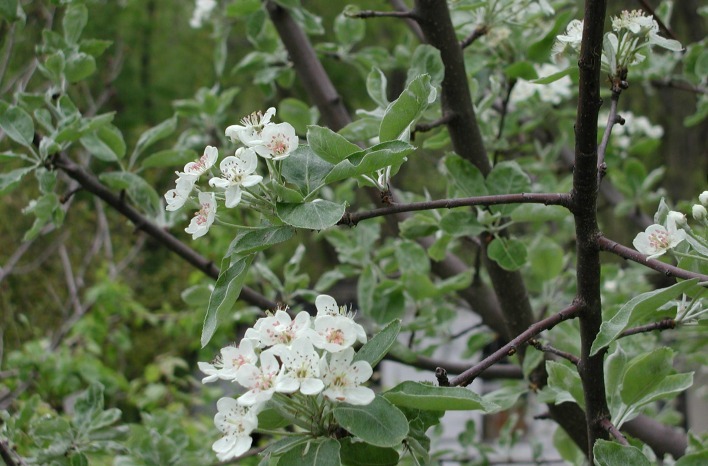 The Shipova tree has some of the characteristics of the white beam. They also have giant flower clusters. Lee has counted 20 flowers in a cluster, so it’s really quite a beautiful tree along with a naturally good structure. Speaking of fruit, they’re about the size of a large plum. In the eastern U.S, the skin is somewhat russet. But if you grow it out west, it has smooth skin. Lee attributes the difference to environmental variations. 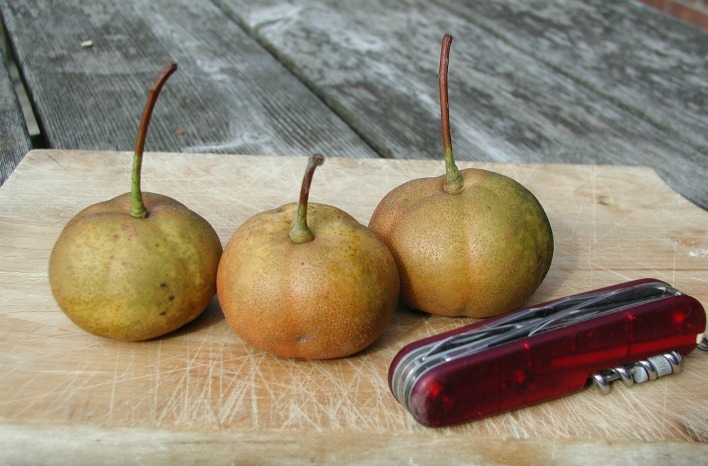 The fruit is ripe in September and its flavor is very much like a pear. It has a really good sort of like a meaty texture. To Lee, it seems like the perfect fruit. The downside is that this tree can get quite large. Too large in fact for Lee’s Farmden. So, he had to cut it down. But he replaced it with a dwarf one. But the other downside is that it takes about eight years before you get your first fruit. nurseries offer dwarf varieties, which seems like a real plus because trees often bear sooner and there’ll be smaller. 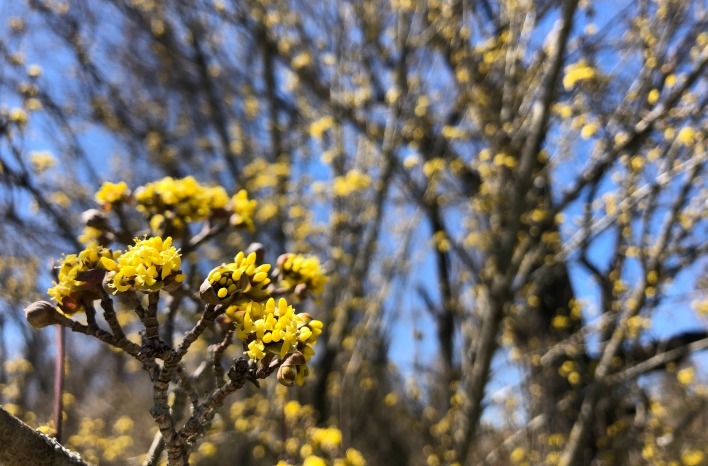 Another fruit tree that’s usually planted primarily for its ornamental value is Cornelian Cherry – a species of dogwood (Cornus mas) that has a nice natural form, showy bark, and attractive flowers. However, the flowers are very different from the common dogwood most people are familiar with. Cornelian cherry flowers are very small. Yet to make up for that minor shortcoming, there are many more flowers, and they’re yellow. They also bloom very early. Even in Lee’s zone five, it typically blooms by the first day of Spring. Which would lead the astute observer to think those blossoms are going to get frosted. But they don’t. Lee is unsure as to knowing if they don’t get frosted or if they just have a long bloom period. But he has never not gotten a crop on them. Cornelian cherries are a very ancient fruit. It was really popular in ancient Rome and ancient Greece up to about the end of the 19th century. It was a fairly common fruit in Europe and then fell out of favor along with a lot of other fruits around 1900. Lee speculates perhaps that’s when the whole fruit industry became more commodified, replaced by apples, peaches, and more. Perhaps Cornelian cherry’s resurgence was because it was thought to be a good stand-in for the tart cherry; much easier to grow, no particular pest problems and they’d fruit over a longer period in late summer. In addition, it basically looks like a tart cherry, and it has a single small seed in it. Yet not everyone likes the flavor, in spite of its tremendous eye appeal – a beautiful fire engine red. In Lee’s casual taste tests with his various audiences, about 40% of people who try it spit it out. They can’t stand the flavor of it. Lee is one of those. But he still recommends it because it’s a great food if you do like it. In describing the flavor of Cornelian Cherry, Lee struggles here a bit, offering only that it’s tart with a little sweetness. But for Lee, there’s a certain flavor he just doesn’t like. No matter whether you like the flavor or not, the ornamental appeal is clearly there. The fruit itself is very ornamental coming on from late summer into fall. While Cornelian cherry will fruit by itself, it fruits much better if it’s got a different variety to pollinate it. The mature size is about 25 feet tall. And it can be kept small too. Lee has a specimen that over 20 years old and only 15 feet tall by 8 feet wide. The pawpaw tree is interesting to Lee because it’s not a fruit you would expect to find growing where he lives in zone 5. Winter temperatures can get down to 20 below zero Fahrenheit. Even so, it does not phase the Pawpaw. So why is this surprising? As Lee says, it has had a lot of tropical aspirations. For those that like native plants, like the persimmon, it’s a native fruit. First of all, the tree looks tropical with long, lush green leaves, much like avocado leaves. So, it doesn’t look like a food that should be growing here. But it’s actually quite attractive. This is another fruit that Lee taste test marketed. And once again, people loved them. They buy them because they have quite a unique flavor. But as with other uncommon fruit, this is one that doesn’t have a long shelf life. 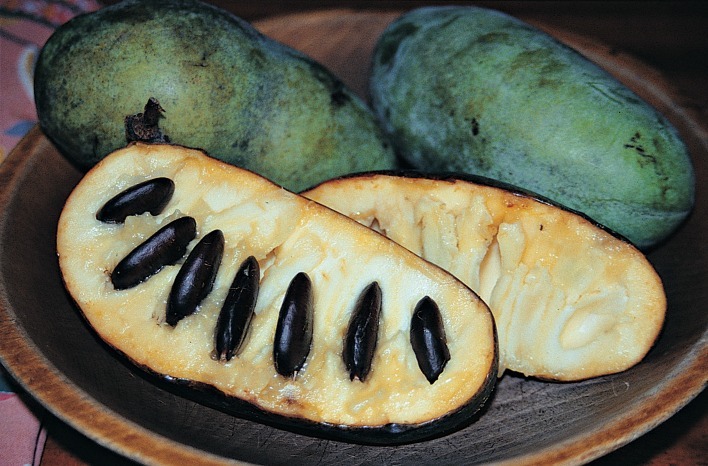 Pawpaw is a member of the custard apple family. The fruit grows in clusters like bananas. And it sort of has a banana-like taste. Lee describes it as the flavor of banana with a little mango, avocado, and pineapple mixed in – sort of like crème Brule without the sugar and fat. 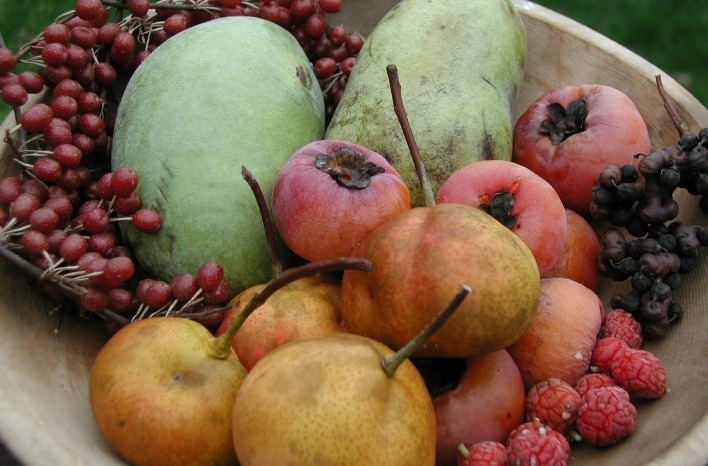 The best-tasting fruit comes from named varieties. First, they will be larger than the wild ones and they’ll also have better flavor. They vary quite a bit in flavor, not only from variety to variety but from how ripe pick them. If you’re planting pawpaw, this is a rather forgiving tree. 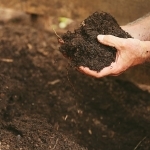 Just give it sun, well-drained moist soil and basic fertility. Even better, deer don’t particularly like it. 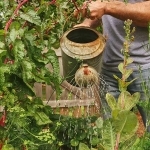 But you do need to plant two different varieties for pollination to produce fruit that begins bearing in mid-September. 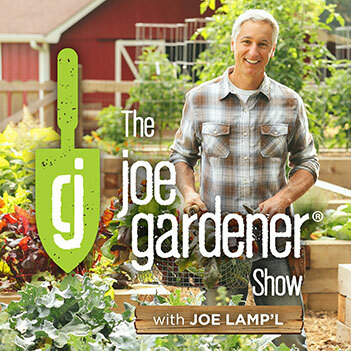 If you’re tempted to plant pawpaw’s, Lee cautions against planting more than two. The fruit is delicious yet very rich. Suffice it to say, a few pawpaw fruits go a long way. As for harvesting, it’s sort of like a banana. You can pick them a little under ripe. Personally, the main reasons I grow pawpaws is that they are the primary host plant for the Zebra swallowtail butterfly. Why not plant it for that reason alone? One of Lee’s favorite fruits of all is European black currant. And it’s very easy to grow if you live in colder climates. But this is a plant that really likes it cold. So, if you live south of Virginia in the United States, summers are likely too hot. However, it might grow in the shade or if you live in a mountainous region anywhere else where it’s cooler, European black currant may work for your location too. When it comes to flavor, it’s not a fruit that everyone likes. European black currant has a very strong, very distinctive taste. And Lee loves it. He describes it as being between sweet and tart. The good varieties are very strong, but with a resonate very aromatic taste. it’s a very, very popular fruit in northern Europe. Plus, it’s super high in vitamin C. Lee says it makes oranges seem like water as far as the vitamin C component. 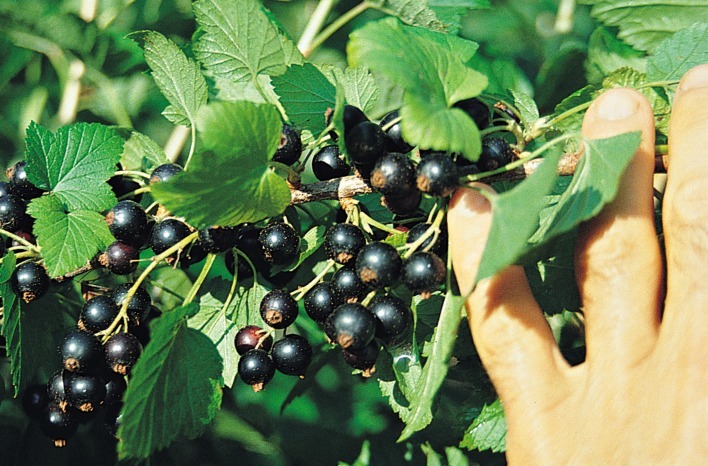 European black currant is the main flavor base for Ribina (an English-origin brand of blackcurrant-based uncarbonated and carbonated soft drink and fruit drink concentrate) and the alcohol drink Crème de cassis. And even if people don’t like the flavor right off the bush, everybody likes it when it’s cooked into things. It’s really a great fruit to combine with dark chocolate. As far as ornamental value European black currant has lush green leaves, but Lee does not consider it particularly ornamental. This is one of the few foods that do well in shade, especially as you go further south. And always a plus, deer don’t like it. It’s self-fertile. and there are a number of varieties available. Lee says European black currant is simple and easy to grow with fruit bearing by the second or third year. They bear fruit on one-year-old wood. The fruit ripens typically around northern New York towards the end of June or early July. Excess fruit can be frozen by simply spreading them out and on a tray and letting them freeze and then putting them in freezer bags. 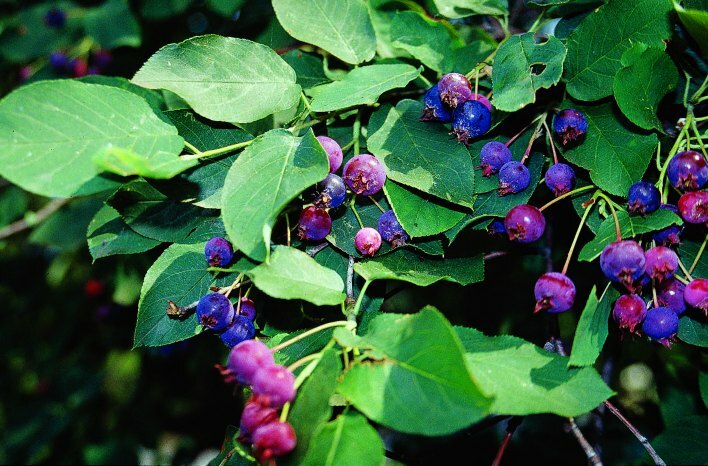 Juneberry is a very ornamental shrub or small tree with great taste. it’s really ornamental. In fact, it’s planted more for its aesthetic appeal than as an edible fruiting plant, even though Lee says it tastes great. The fruit looks like a blueberry, but it’s related to apple and pear and it has many of the same problems. Juneberries are wild in every state of the U.S. Well known as an ornamental plant for its fall color, interesting bark, and attractive spring blossoms. 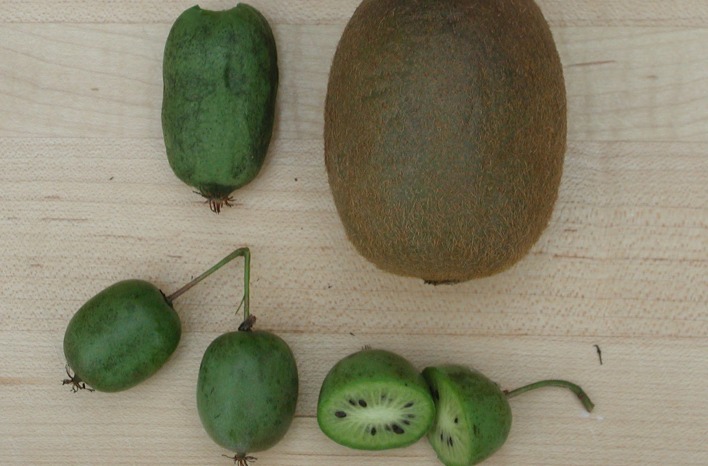 The Hardy Kiwi fruit tastes very similar to the tropical supermarket fruit but hardy kiwi fruit can grow into zone four. The general consensus from taste testers is that hardy kiwi is much better tasting noting that it’s sweeter and much more aromatic. It’s the size of a grape with a smooth skin so just pop it in your mouth and get ready to enjoy an amazing taste sensation. 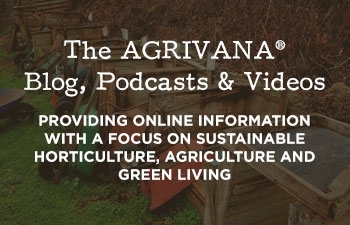 There are two main species that are grown for their fruit: Actinidia arguta and Actinidia kolomikta. The differences are important because for most homeowners nowadays, Lee recommends the Kolomikta species. It’s often sold as Arctic Kiwi because it’s so hardy. 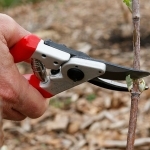 And the reason he recommends that one for most people is because the kolomikta is much easier to maintain every year with pruning. 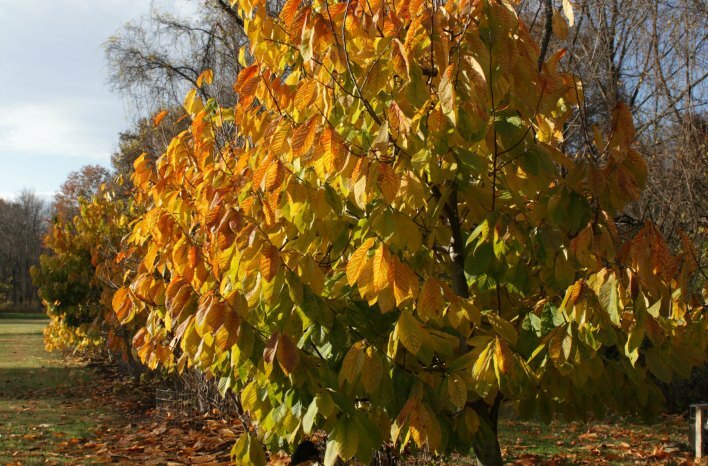 Hardy kiwi was introduced into this country in the late 1800s not for their fruit but for their ornamental appeal. 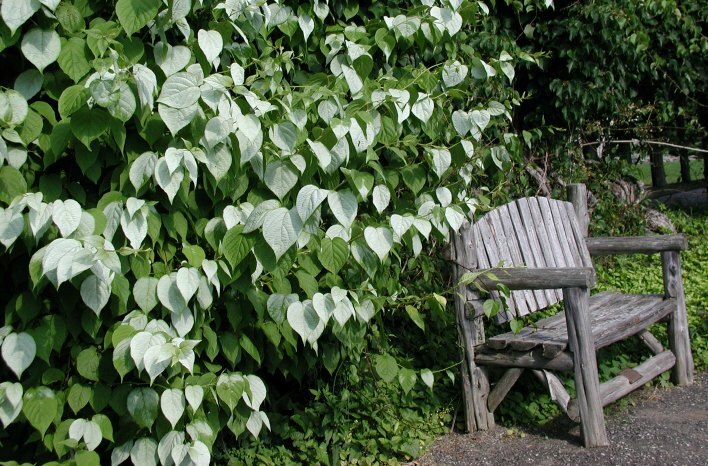 If you go to a lot of old estates like Dumbarton Oaks in Washington, Old Westbury Gardens in New York Botanical Garden, you’ll find these old kiwi plants there. They’re planted as ornamentals. Yet they do fruit. The way they’re pruned just for ornamental purposes is just whacking them back. But for fruiting, you do have to prune them every year. Both species are quite ornamental with really nice-looking leaves. But the arguta has this very nice variation to the leaves, they’re green mostly. But parts of the leaf will be silvery and there’ll be little parts where it’s pinkish also. So, it’s really beautiful. The arguta ripens towards the end of summer. The Kolomikta ripens in early August in upstate New York. Further south it will ripen earlier. Yeah. You can actually pick them a little before they’re ripe. When you see the first one’s ripening if you pick them all and put them in a refrigerator and they’ll keep really well. For fruit production, you need a separate male and female, but that’s not that bad a thing for the Kolomikta, especially because the male is more showing than the female.